In August 1846, the aurist Joseph Toynbee (1815-1866) married Harriet Holmes (1822-1897), daughter of Nathaniel Holmes. The couple eventually had nine children: Gertrude (b.1848), William (b.1849), Lucy (b.1850), Arnold (1852-1883), Rachel (b.1853), Paget Jackson (1855-1932), Mary H. (b.1856), Grace Poleridge (b.1856), and Harry Valpy (b.1861). The Toynbee children boasted remarkable achievements: Arnold Toynbee was the respectable economic historian who followed his father in devoting his energies towards improving social welfare. Paget Jackson was a Dante scholar. Grace Coleridge worked as a bacteriologist and later married chemist Percy Faraday Frankland (1858-1946). Harry’s son, Arnold Joseph Toynbee (1889-1975), was the famous universal historian. The Correspondence & Papers of Joseph Toynbee at the Bodleian Library in Oxford provides much insight into how closely-knit the Toynbee family was. Joseph Toynbee’s letters to his children, in particular, paint a picture of a man who was a devoted father, attentive to his children, and expressive of his affections for them. Much of the correspondences housed at the Bodleian library were reprinted in Gertrude Toynbee’s book, Reminiscences and Letters of Joseph and Arnold Toynbee (London: Henry J. Galisher, 1990). The letters do not mention Joseph Toynbee’s work as an aurist, though he does occasionally notify his children he was attending to a patient or preparing to travel for a medical conference. 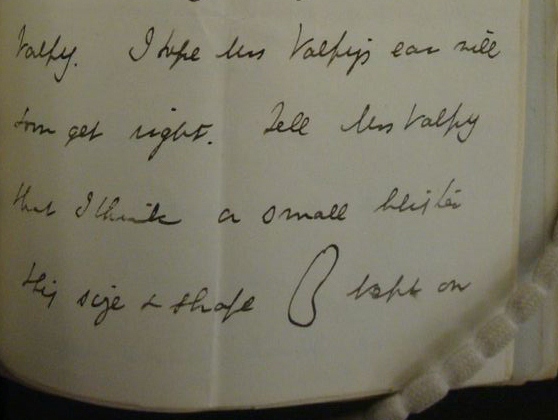 Detail from letter of Joseph Toynbee regarding Mrs. Valpy’s ear.